Just after posting Using Solar Energy, I opened the camper door to head over to Horse Creek where I volunteer with the dogs. Immediately, I spotted a lone GAVS member, obviously on a reconnaissance mission. He made a mad dash back to the cedar trees after I caught him spying on our RV from under the cover of our picnic table. The GAVS have found us! I’d wondered if our Little Big Move would deter rodent attacks, but now that we’ve been located, resumed attacks on the bird feeder are imminent. The Ant gang members have made no further attempts to infiltrate the 5th Wheel, and I’ve only seen one member of the Blackbird gang since putting out the new bird feeder. Unfortunately, due to the fact that the bird feeder is currently on the ground and we have also relocated, members of our lovely Song Bird gang have not been seen at the feeder since the morning of the move. In breaking news, I’ve learned that Green Acres RV Resort Park is currently hosting Arnold Ziffel. Arnold the pig, along with a traveling pig friend, are currently residing in a class A rig parked across from the pool. According to my source, the pigs do have their people companions with them also. I’ve been promised that pictures will be made and posted to Green Acres’ Facebook page as soon as possible. 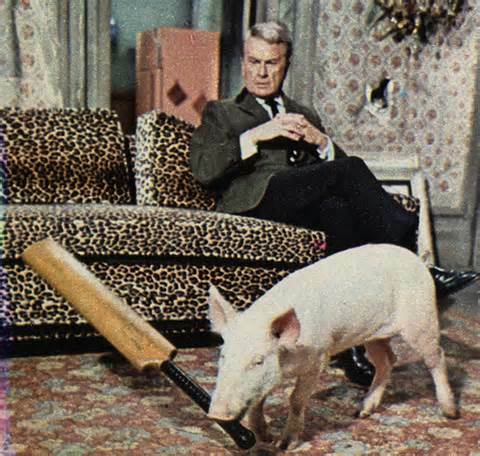 At this point, the celebrity-named pig has not been seen by this reporter, so it is unknown as to whether or not this Arnold Ziffel looks anything like his famous name sake, but we do welcome Arnold to Green Acres.